When I mentioned I was writing another post about astrophotography, I also asked if there were any questions I should make sure I answer. I’m very grateful especially to Julia Evans for asking several very good ones! A lot of these questions have come up more than once, so I thought they deserve their own post. I’ll answer these below to the best of my ability. My answers are all based on my own experiences and limited by my own knowledge, of course. Many answers will vary based on the experience and equipment of the observer, too. I will try to address this in each answer. 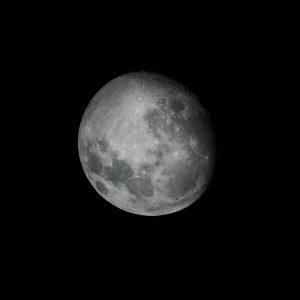 Can I do astrophotography in my city? There are certain kinds of astrophotography which are relatively easy to do within a city, and some other kinds are rather difficult. It depends a great deal on the subject you choose, the equipment you have, and where your city is located. The biggest challenge to pursuing astrophotography in a city is light pollution. (Aside from this, cities also obstruct the sky with its buildings and other structures.) But it isn’t hopeless! Bright objects are still visible. Think about how Venus remains visible even at dusk when the sky isn’t even fully dark yet! Depending on where you are, various objects may or may not be visible. A good way to get a sense of what’s visible with the naked eye or with a telescope is by using the Bortle scale. From there, you can try to identify which zone you’re in using a map such as the light pollution map at the DarkSiteFinder. See the screenshot of what the area of northwestern Oregon and southwestern Washington looks like. The planets are so bright, it won’t matter where you are: light won’t drown those out. Likewise for the moon. Through a telescope, bright star clusters and nebulae would remain visible as well, and you can sometimes squint and see those even without. I’ve also seen decent photos of some very bright nebulae (like the one in Orion) from inside cities. Other subjects, like wide-field views of the stars, details of dusty or dark nebulae, and faint galaxies will be very challenging to photograph. The kinds of exposures needed to capture these will also capture lots of incidental light. A telescope’s primary job is not magnification but light-gathering. The bigger the telescope, the more light it gathers. It’s the same way a magnifying glass can turn sunlight into a spot hot enough to start a fire. A telescope will make any light in the sky much brighter. In the city, it unfortunately can capture a lot of light you don’t want to see, and details will look pale and indistinct. How fancy does my equipment need to be? Just like with any photography, there’s a huge range in fanciness, costing anywhere from a couple hundred dollars to many, many thousands. A beginner’s telescope of any significance might start around two or three hundred dollars, in the United States. There are less expensive ones, to be sure, and any telescope is better than no telescope. In fact, there is a huge market for used telescopes—find it if you’re on a budget! But here, I define “any significance” as a telescope flexible enough for looking at many categories of things and able to be accessorized. I began by using one of those and putting my iPhone up to the eyepiece of my first telescope. This would be the very first astrophoto I’ve ever taken, and you can see it on the right. There’s a lot of light leaking in, and the photo is really indistinct. All of this could have been easily fixed with a twenty-dollar accessory, which would have held it still, at the right distance, and blocked out the extra light. This is a perfectly fine way to get started. Later on, I took some better moon photos doing basically the same thing with another camera. The only improvement I made was just holding it a little differently and manually focusing (the manual focus is the reason I switched out the cameras). I never really subjected these photos to any real editing besides some light touching up in Apple Photos. 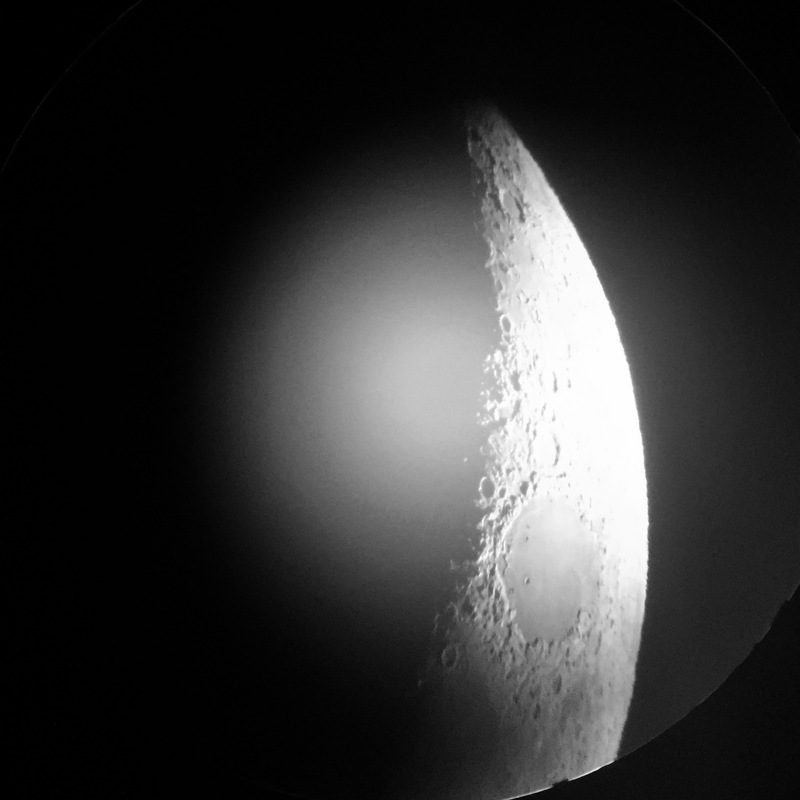 Nevertheless, these were pretty challenging to take because I was literally just holding up the camera to the eyepiece of the telescope, making sure they were lined up perfectly, and moving the telescope to track the moon at the same time. I wish I’d gotten that smartphone accessory, but I decided instead to upgrade everything. My post Beginning Astrophotography: Jupiter Ascending describes the first upgrade I made. In Beginning Astrophotography: Journey to Jupiter, I go into much greater detail about my equipment choices, budget, and capabilities—but remember that my choices don’t have to be your choices. What kind of camera do you use? Does it have to be a fancy camera? I currently happen to use a Sony α6300 E-mount camera with an APS-C CMOS sensor. This is a mirrorless camera, meaning it’s significantly smaller and lighter than a full DSLR camera but gives me a lot more control than either a smartphone camera or most point-and-shoot cameras. I chose this one with astrophotography in mind because of its extremely rapid autofocus (when using a lens, good for wide-field) and its ability to take 4K video, but I use it for general photography too. A lot of people taking pictures of the sky at large seem to use DSLRs because of the quality and size of the sensor and because of the fine control it gives them (allowing them to expose for a long time, for example). When it comes to the telescope astrophotography, I almost always see people using a purpose-made CCD (charge-coupled device) camera. These cameras are almost like purpose-built webcams that strap onto the back of the telescope and are specially made for gathering space photos. They can run a few hundred or on up. All that said, the difference in sensor really becomes relevant once you start using techniques that exaggerate the noise it gathers. A smartphone camera is a fine place to start, and remains part of my repertoire because it’s just so damn easy. These phones’ cameras are becoming indistinguishable from mid-range consumer point-and-shoot cameras. What kind of stuff can I see through a telescope with my eyes? Oh, all sorts of things! But they may not look as you expect. Telescopes do funny things that defy all our expectations. Everything you see is turned upside down. (There are a few telescopes which don’t do this, but they have drawbacks and are seldom used.) This isn’t a big deal for looking at the sky, usually, but makes it hard to orient yourself. Everything is much brighter. Depending on the aperture (width) of your telescope, a sky which appears pitch black will have a soft blue glow. The moon will become bright enough to leave spots on your vision and even be painful to look at for long. Planets will glow like headlights in the distance. Stars will be much brighter and much more numerous. There’s nowhere you can point your telescope that some stars won’t be visible, especially in a dark area. A star will never appear to be more than a very bright point at most, though, unless the star is actually something else (two stars, a small nebula, a planet, or whatever). No telescope on earth can zoom in enough to see a star as more than a point. Star clusters will look like bright scatterings of jewels, like little private Milky Ways only you can see sometimes, or like indistinct smudges at other times. The Pleiades will have bits of dust around them. Bright nebulae will look indistinct to the naked eye and will vary a lot by light pollution. The Orion Nebula will be dark and dusty and look as if there were glowing pearls seen on a sea floor among sand. The may be difficult to make out any color if you’re standing in a city or using a smaller telescope. Planets and the moon will appear to shimmer, as if viewed distantly on a very hot day. In particular, most of the time, focusing on a planet will seem challenging, as if just when it’s about to come into focus, it goes right back out. There are times when you’ll have better luck than other times—when the seeing is good. Unless you’re using a telescope with automatic tracking, everything is going to move—fast. To be sure, this is the Earth’s motion, but you’ll be surprised just how quickly things move out of view. When I first began looking at planets, I had perhaps twenty seconds to look at them before they were totally out of view. The less magnified they are, though, the less the motion is magnified. It’s one thing to know all these things. It’s another to put your eye to the eyepiece and look and make sense of what you’re seeing. It literally takes practice, over minutes, hours, and several occasions, to get better at actually seeing what you see because they are so outside of our experience. You’ve never really seen anything like, say, the Orion Nebula—you’ve seen evenly exposed, two-dimensional halftone prints, or you’ve seen pixellated digital images constrained within the sRGB color gamut. The actual celestial body—the scintillating, shimmering indistinct dust cloud, stars littered within it, fanned out between the poles of dimness and brilliance, filled with colors and forms you’ve never seen before—is indescribable. Our brains are not designed for this sight, and our lives have not prepared us for the experience. What objects are there? Is it only Earth’s moon and some planets, or are there other things you can look at? I’ve named several already, but lemme categorize! There are planets! The classical ones (out to Saturn), and some people like to look at the ones further out. Then, there are the planets’ moons! I’ve seen photos and even animations of the Galilean moons transiting Jupiter. When there are comets around, people with telescopes can spot these well before the rest of us. 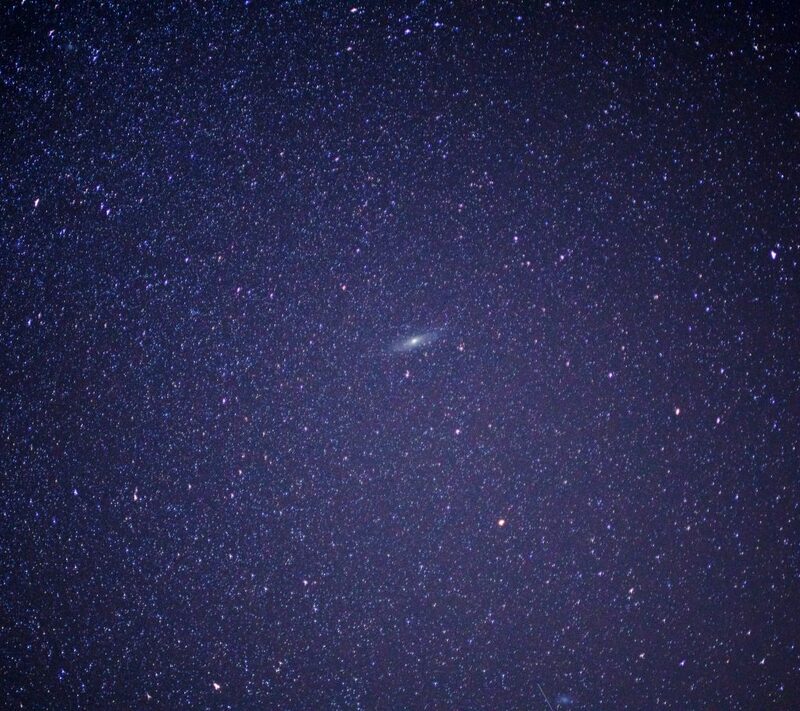 galaxies like the Andromeda Galaxy, Triangulum, etc. A guy looking for comets in the eighteenth century, Charles Messier, got really annoyed by all the smudges he saw which were not comets, and he began listing them as Messier objects. The current list is a decent smattering of deep sky objects, all of which are decently easy to observe with a telescope. I originally got this question in a longer form, with several questions clustered together that I wanted to answer at once. can you see GPS satellites? (or are those in geosynchronous orbit so no? what even is geosyncronous orbit?) can you see the international space station? In general, low-earth-orbit satellites are often visible. Their motion usually makes them obvious. They’ll be a brightish dot drifting along very obviously. It won’t generally be able to see much more detail than that. It’s possible to distinguish from an airplane because an airplane will often have blinking colors to it and will appear to approach from the horizon, grow faster and brighter, and then dim and appear to slow toward the opposite horizon. Satellites are usually singular, steady lights which move at a fixed speed. One phenomenon to know about is the “satellite flare,” also known as an “Iridium flare,” where a satellite will suddenly grow bright in the sky for a moment and then dim again. This is where a satellite catches the light from the sun on its surfaces (such as its solar panels) and reflects it back down to us. The International Space Station is the brightest satellite of all and is very often visible. It moves very quickly because it circles the entire earth in about ninety minutes, which makes photographing it challenging. That doesn’t mean people haven’t tried—and succeeded! I’m not an expert on this, so check out this rad article on spotting and photographing satellites, including the ISS, which includes some ISS photos! GPS satellites are not in geosynchronous orbits. They’re in medium earth orbits, about twelve thousand miles above the earth, which is fifty times further away than the ISS or most other satellites. They take about twelve hours to go around the earth. I don’t really know precisely how big GPS satellites are, but if they’re about the size of a bus, they subtend maybe roughly a tenth of an arcsecond at that distance (based on some quick back-of-the-envelope math I did). This article says the limiting resolution of the atmosphere is usually about two or three arcseconds (rarely less, but never a tenth). This is assuming the satellite puts off enough light to be visible at such a small size and you know precisely where to find such a minuscule thing. It’s probably out of the question that you could see a GPS satellite, even under the best conditions and with the best telescope. Geosynchronous orbits are twice as far up still as GPS satellites, perhaps twenty-five thousand miles up or so. This far up, a satellite moves along slowly enough that it’s always above the same longitude of the earth, and if it were visible (though it wouldn’t be unless it were huge), it’d appear not to move eastward or westward. If the satellite is above the equator, it’s called geostationary, and the position of the satellite would appear to be fixed like a star. These orbits are useful for communications and weather satellites, but this is getting off the subject of astrophotography, so I won’t get into the mechanics of this. How do you figure out when the stuff you want to see is going to be in the sky? Do you use an app or something? I use an app called SkySafari. It has a feature that can prepare viewing lists for a given evening. I can also choose a time and see what the sky looks like at that time. It helps me determine what magnitude a given object will have, sort by magnitude or category, and other features. I also use a website called the Clear Sky Chart to know whether conditions nearby will be amenable to observation. Here’s the Clear Sky Chart for Portland. And here’s the chart for a state park where I can more easily access dark sky conditions. Can I see cool stuff on the moon? Depends on what you mean by cool! The moon, viewed through a telescope, is indescribably vivid, immense, and gorgeous. Even looking at it through binoculars can give you a sense of what I mean. Where it’s always been a perfect sphere with indistinct features on it, it becomes a landscape with mountains casting shadows, basalt plains, and craters that look as fresh as when they were made. If you mean man-made things, unfortunately, no. Man-made artifacts on the moon are much too tiny. The moon is huge. Why do you love having a telescope? Later, I got newer books from the library, with clearer photos and more precise facts, and I filled in the gaps in my knowledge. But the more I learned, the more complicated everything became. The new information didn’t just bring more answers—they brought more questions, more mystery. And the mystery drove me on. It’s like this. I grew up in an isolated and insular place. My upbringing didn’t give me the opportunity to travel. I’d never seen mountains, deserts, big cities, foreign countries. Books describing space and all the things in it gave my imagination worlds to seize upon, and I imagined adventures to inhabit them. The subjects they described, the planets and galaxies and nebulae, loomed large in my heart and in my mind’s eye. Actual stars—and not celebrities—were my stars. This is why I said, in my First Stargazing post, that seeing Saturn for the first time was like seeing a celebrity for me. It was literally difficult to accept the reality once it finally presented itself. I had always wanted to see these things with my own eyes, through no one’s filter. I had assumed they were out of reach until I looked into it and realized I was simply wrong. With a bit of equipment and a lot of practice, I could get started and see for myself the things I’d been reading about all my life. When I first saw another galaxy, I had seen across a timeless gulf that no person could ever cross. I’ve seen a storm on Jupiter older than centuries. I’ve watched the Earth wheel under my feet so fast I could barely keep up. I’ve gotten lost among stars without names. Seen without the intercessor of someone else’s words, or someone else’s photos, new parts of the sky opened to me which had previously been ineffable and therefore lost.